This book deserves a better introduction than I am going to give it! I can’t think of butterflies anymore without thinking of my two-year-old niece, Mary. Mary is a bit of a clod, in a cute, bumbling two-year-old way. She has a lisp. And she’s just getting prolific when it comes to words, even if we can’t quite understand them all. She and her four-year-old sister Adele have lately taken a liking to the movie Bug’s Life. Heimlich the caterpillar is the Pixar version of Mary. Pudgy, optimistic, a bit unrealistic (“I’m a beautiful butterfly!“), and gurglingly funny – that’s Mary! Unfortunately, Mary’s going through this phase where she asks everyone who walks in the door, “Do you have Bug’s Life?” Only she has that lisp thing going on, and it comes out more like this: “Do you have Butth Lithe?” If you don’t know the kid, the question can be a bit disconcerting! 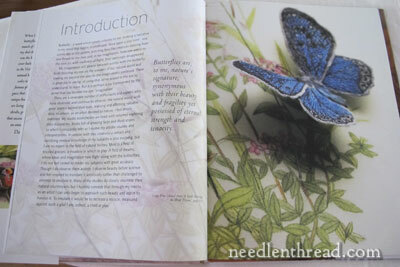 Well, today I’m going to show you a book that’s full of embroidered butterflies, each of which is truly a “beautiful butterfly.” The book is a little different from the types of embroidery books I normally review. 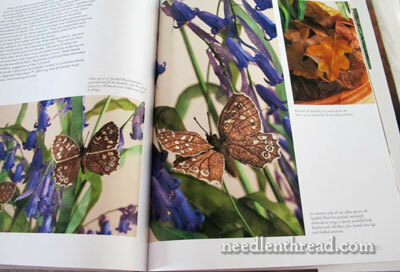 The Art of Embroidered Butterflies is a book of Pure Inspiration. It’s packed with artistic inspiration, and though light on the technical how-to instruction that we are used to from project books, it still instructs. 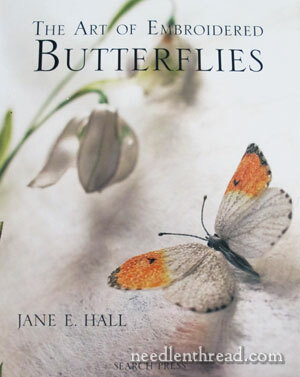 The Art of Embroidered Butterflies by Jane E. Hall was published in September of this year by Search Press. It’s a hard-bound book with a nice dust jacket, and it’s a beautiful book. It belongs out on your coffee table, where people can meander through it slowly and enjoy it. But it also belongs in your workroom, where you can learn from it! 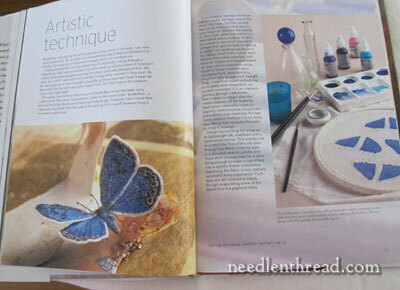 The book is about the author’s particular niche in the art world – the embroidered butterfly. But Jane Hall’s embroidered butterflies are unlike any embroidered butterflies I’ve seen. They are ethereally light and incredibly real. Each one is an amazing artistic creation – so close to the real thing that, at a glance, you may very well be duped. The book fills me with a sense of wonder – it’s a study of a corner of the natural world that is truly wonder-filled. From the title pages to the forward to the introduction of the book, butterflies abound. You’ll find them scattered throughout, each preparing to flutter off the page. The bulk of the book is arranged around these “Butterfly Studies” – 13 studies, each examining a type of butterfly up close, including information on its habitat and life cycle, and illustrating the authors recreation of that butterfly in embroidery. 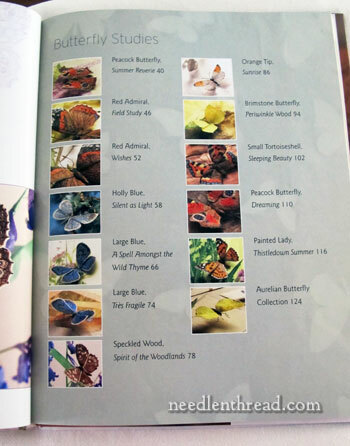 The book includes a preliminary section on butterflies in nature. This is where our sense of wonder begins to build – the author opens our eyes to the fact that the butterfly is an amazing creature! Next, we see the materials Hall uses to create her little wingéd masterpieces. Silk abounds! The overview of materials used is followed up with a glimpse into the artist’s studio. Here, the author talks about creative space and the things that inspire her creativity. From here, we move to her butterfly collections – these “ghosts” of butterflies with their brilliant colors, collected from the places they “sought their final rest,” and gingerly preserved in beautiful old printer trays, where they prove to be most reliable models for Hall’s art. After these preliminaries, we are taken into the studio to see the author’s artistic technique in action. Here, in ten pages, Hall explains to us how she goes about creating her butterflies. We see the materials she uses and how she uses them, but without actual “how to” instruction. That’s not to say that we can’t learn from this chapter on technique. On the contrary, that’s what it’s here for – that, and to give us an appreciation for what goes into each little butterfly. But this part of the book is more of an explanation of what the author does, rather than instruction in how to do it. 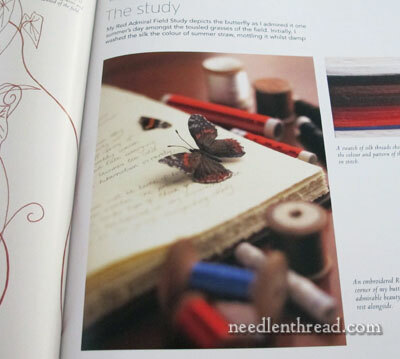 Still, for the embroiderer who wants to create beautiful and realistic butterflies, this section of the book is packed full of good information that can be used as a starting point. 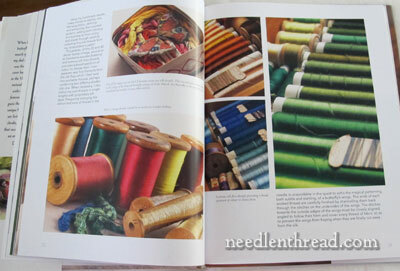 If nothing else, in this section of the book, we can revel in the beautiful photos of the threads! Her information on thread selecting and color selecting is worth reading. And there’s wonderful information on how she creates the bodies and all the little parts. Her butterfly bodies are incredible! And then, the bulk of the book – the butterfly studies. 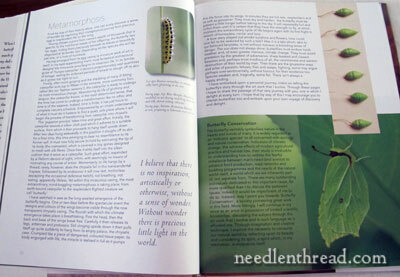 Each one is an engrossing chapter on the butterfly itself and the creation of its counterpart in embroidery. Here, we really see the artist at work. Each study is a detailed lesson in observation, artistic appreciation, and replication. The book ends with… more butterflies! It’s difficult to give a list of pros and cons for this book. I really love this book, even though I’m not an avid butterfly person. I like butterflies (and I certainly appreciate them better now), but I’ve never studied them up close or made them a subject of my own needlework pursuits. But for what it’s worth, here’s my pro-con breakdown. 1. It’s not a technique / project book, per se. You will not receive step-by-step instructions here for creating “this particular butterfly” that looks “just exactly like this.” If that’s the type of book you like or want, this may not be the book for you. 2. I can’t think of any others. In the US, you can find The Art of Embroidered Butterflies through Amazon. 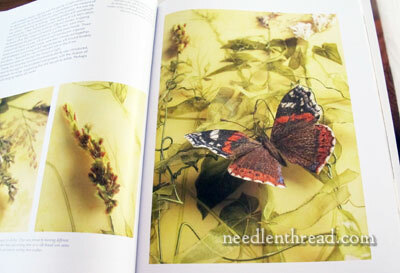 Worldwide, with free shipping, you can find The Art of Embroidered Butterflies through The Book Depository in the UK. Thanks for another great review. Jane Hall’s art just blows my mind. I’ve seen her at the Knitting and Stitching Show in London, and have seen some of her work before featured in magazines – she does waaaaaaaaaaay more than butterflies, too, and everything just looks incredibly real! Great to see she’s brought out another book. Might be tempted by this one! I saw her work ‘in the flesh’ 2 weeks ago at the Knitting and Stitching Show – very delicate and lifelike. Not only was it nice to see something actually attractive (!!!) in the textile gallery section, but you could have a really good look at each piece as there were even magnifying glasses available to use. I had a look at the book there too – lovely! Your book review on the butterflies cannot be more timely. I bought the book immediately on Amazon…. Butterflies and ladybugs remind me of my little girl and I’ve been having a pretty hard time the this holiday season missing her….. Thanks for your review on this book. *Sigh* Not really; I’d love to sit at your feet and learn from you in person . . . but this book is just . . . gorgeous. I need to make a Steampunk costume for next summer, and I now believe that it needs Butterflies on the hat. With realistic wings after Ms Hall’s examples mounted on metal hinges, and gear-work bodies. 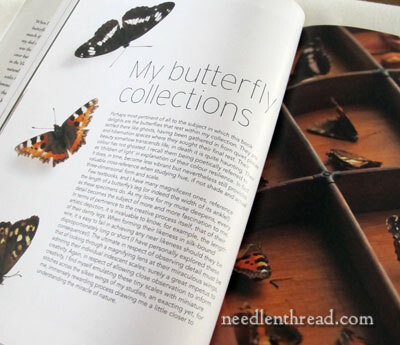 I too have the book and would recommend it to anyone who does embroidery or loves butterflies. Love it. HOWEVER – I can add to the con list – she lists the tools in GENERAL terms but doesn’t list brand/vendors anywhere. On the needle info alone that would be great to have the source – I don’t think I will ever do her work but the point of round holes for the thread is so true and so could be useful for other applications too! Oh Mary, you have done it again. I love this book already and I haven’t even seen it up close and personal, but I will. I adore butterflies and the crazy quilt I am making at the moment is all about them, they are on every block but of course in nothing like this detail or beauty. Jane Hall does exquisite work and this looks like no exception. Thank you for showing me my Chrissie present to myself. Well, I’m not sure you’re good for my pocketbook. I could NOT resist this one. Ordered it after reading your review and seeing it and it’s already been sent!!! I can’t wait to get it. Merry Christmas to me. LOL. I so enjoy your posts each day- I miss you on the weekends. Thanks so much. Well, I didn’t read the others before posting so I see I am not alone in being influenced by you! Hahaha! I also purchased her other book. From these gals reviews I think I will be glad to have both. I wish you were my neighbor too. Wouldn’t it be lovely to just have a whole neighborhood of artists and stitchers?! Love this review of a gorgeous book. There’s something lovely about butterflies, I have made a few in bobbin lace and tatting (white thread), but the coloured ones are brilliant and so life-like. Ahh I love Mary she sounds so cute!!!. 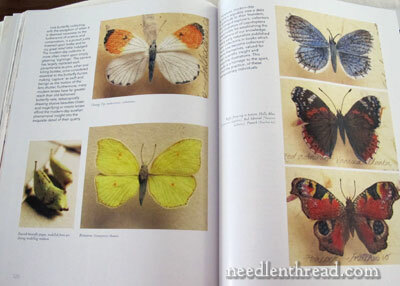 Thanks for your article on The Art of Embroidered Butterflies beautiful photos, I love the page on Jane’s workroom it’s always interesting to glimpse at other people workspace and how they become inspired. 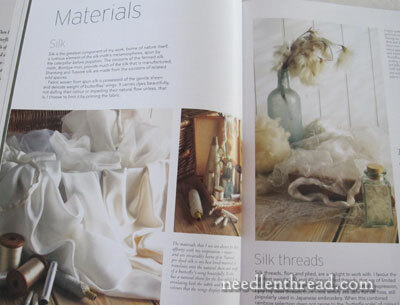 The photos of the materials Jane uses are equally beautiful silks, silks and more silks wonderful. The book looks amazing. I am a butterfly person and I just ordered this book! So excited! For those in the UK – you might like to know that there is an entire article about Jane Hall and this book in this month’s Stitch magazine, and also a separate book review. I think there might also be a reduced price offer, but I can’t remember! Wow, they are truly the most beautiful butterflies I’ve seen. That book will be on my wishlist for sure. I do a lot of 3D work using hand pulled and natural dyed silk threads, and have just stitched various bugs as Christmas gifts. 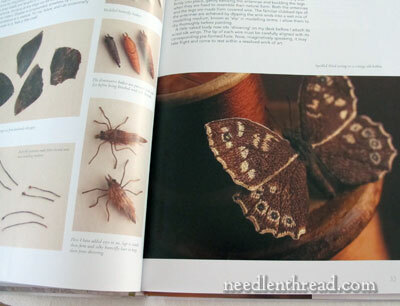 Any of Jane Nicholas’s books have ‘how-to’ butterflies amongst her stumpwork projects. Oh, Mary how you whet our embroidery art appetites! Happy New Year 2014! Previous Previous post: Short & Sweet – Project Update! 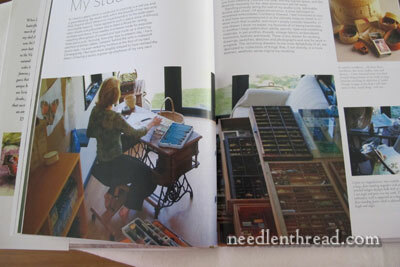 Next Next post: Needlework Environments & Trish Burr Kit Winners!